Ehlena Fry, 12, of Michigan, sits with her service dog Wonder, while speaking to reporters outside the Supreme Court in Washington. At bedtime last night my girls wanted to know the names of female superheroes and were thrilled to hear me name Wonder Woman. I had little more to add to describing her to them as the last encounter I had with her was a comic book fifty years ago. I looked her up to learn about her origins and superpowers—she was sculpted from clay by her mother Queen Hippolyta of Amazonia and given life by the Greek goddess Athena. Wonder Woman possesses an arsenal of advanced technology, including the Lasso of Truth, a pair of indestructible bracelets and a tiara which serves as a projectile. She has been around since 1941, and late last year the United Nations named Wonder Woman a UN Honorary Ambassador for the Empowerment of Women and Girls. 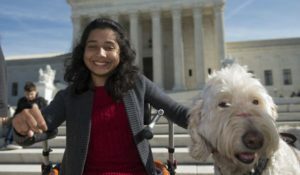 Moving from the fictional to real life, Wonder Woman has a young girl and her labradoodle Wonder at the center of a unanimous Supreme Court decision yesterday (8-0) defending her right to be accompanied to classes by her service dog. Ehlena (Fry), a 12-year-old with cerebral palsy, necessitating her use of a wheelchair, was denied the company of her dog in the Napoleon School District in Michigan. Ehlena met Elena, as in Justice Elena Kagan who led the cross-examination of the defendants and ruled for Wonder Girl. Another Wonder Girl shared with my girls is the battle of Sydney Phillips and her family with St. Theresa Catholic School. The small parochial school in Kenilworth, New Jersey, disbanded the girls’ basketball team this year leaving Sydney, a seventh grader, still wanted to play basketball for her school and asked if she could join the boys’ basketball team. She was told no. Making matters worse, when her parents sued, she and her younger sister were expelled from school. A New Jersey Appeals Court judge, Judge Amy O’Connor, reversed a lower court decision and ordered the school to reinstate the Phillip girls followed by a further ruling for Sydney playing for the boys’ basketball team. In her first game, she scored 4 points, grabbed two rebounds and two assists. No wonder. Girls have role models today, not just a fictional Wonder Woman. They have Wonder Women and Wonder Girls on the benches of basketball courts as well as courts of law—as high as the Supreme Court—sitting on benches once reserved only for boys and men. These and other great stories are shared in The Male Supremacy Narrative class and point to a new human narrative of equality, a vision of the Kabbalah. The most significant symbol of the United States is of a goddess holding a flame-LIBERTY. French Freemasons gifted the state to their American brothers in honor of this country,which was built upon Masonic principles. The Freemasons’ foundations go back to the ancient principles of King Solomon,which include the recognition of the feminine and masculine aspects go God. They used the Egyptian goddess Isis as their model. Sir Frances Bacon left his mark by placing the goddess Virtus on the Virginian flag. Athena stands in the state flag of California and a mosaic of Minerva in th library of congress in Washington D.C. There is a statue of Joan of Arc,the patron saint of France,by the Louvre. At the age of 14,this uneducated farm girl received messages from Archangel Michael and St Catherine to save France from British invasions. Filled with doubts,Joan followed this Divine guidance and led an army,which ensured France’s independence. Soon after she helped Charles gain the throne in France,he sold her to the British,who tried her for treason and heresy. She was burned at the stake when she refused to deny the voices of angels and saints. HBO DOCUMENTARY FILMS: PAYCHECK TO PAYCHECK – THE LIFE AND TIMES OF KATRINA GILBERT. Our every day female hero’s who live on the brink of poverty. Doc-logoOverview: Filmed over the course of one year in Chattanooga, Tenn., PAYCHECK TO PAYCHECK follows Katrina Gilbert, a 30-year-old mother of three who works as a certified nursing assistant in an extended-care facility while striving to address her own health-care issues. Overworked, underpaid, uninsured and lacking support, she chooses daily between purchasing her own medication and paying for the needs of her three children, which often leaves her struggling to make ends meet. Despite these obstacles, Gilbert works to better her circumstances, Docs_Paycheckapplying for college courses that could raise her income. But circumstances often leave her slipping backwards, wondering if she will ever truly be able to get ahead. From Maria Shiver’s groundbreaking multi-platform project “The Shriver Report: A Woman’s Nation Pushes Back from the Brink,” PAYCHECK TO PAYCHECK: THE LIFE & TIMES OF KATRINA GILBERT is directed and produced by Shari Cookson and Nick Doob (HBO’s Emmy-winning THE MEMORY LOSS TAPES) and executive produced by Peabody and Emmy-winner Maria Shriver (HBO’s THE ALZHEIMER PROJECT) and HBO’s Sheila Nevins. The film is termed an unvarnished account of a single mom struggling to get ahead, but constantly getting knocked back by a system that almost seems designed to see her fail. Expectations: Maria Shriver states that “We all know Katrina Gilbert – she’s our friend, our sister, our daughter, struggling to make her way in the world.” That statement is important to me. I know many a woman in the rural region in which I live that has a life like the one described here. Being familiar with people living paycheck by paycheck it is going to be hard for this story to be surprising. I am just hoping for a complete story discussing all the stresses and encapsulating not just how a single mother copes but how anyone survives paycheck to paycheck. It is a dime a dozen story but the story of Katrina and family does draw you in. Don’t look for resolution in this piece though, because it is not there. By film’s end 75 minutes later we see her still moving forward the best she can. For those who don’t know how this demographic of society survives from paycheck to paycheck then this documentary will illustrate it for you, but you’ll probably never watch it. In Conclusion: It was a good story to tell and a good addition to the “Shriver Report” which is an ongoing awareness campaign of Maria Shriver’s all geared toward empowering women. Whether the bit of notoriety Katrina Gilbert gained through this documentation proves prosperous for her is unclear at this point, but we can hope that it did. Through the film we see that she tries hard to do right by her family, even at the neglect of herself. Hopefully now she can afford to complete college. Hopefully, people take in this documentary and understand the plight of the many just like her.